Motoring enthusiasts tell the story of Britain's racing legends. Jim Moir (Vic Reeves) tells the life story of 70s icon and motorcycle world champion Barry Sheene. 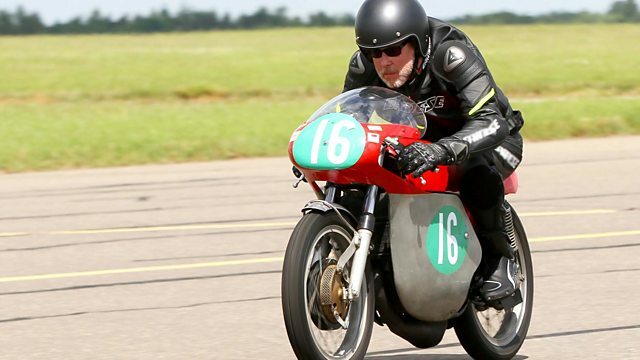 Jim Moir (Vic Reeves) tells the life story of 70s icon, motorcycle world champion Barry Sheene, and rides the bikes that are part of the Sheene legend. Moir tells how Sheene rose to the top of his sport and also became a hugely popular public figure, transcending the world of bike racing. As well as taking to the track himself, Moir meets members of Sheene's family, close friends and rivals. Packed with rare archive and home-movie footage, the programme gives an intimate and enthralling portrait of a man who lived life at full-throttle and who, in his career, survived more than one hair-raising crash. Composer: Larry D. Brown. Performer: The Cinematic Orchestra.